Bangladesh 2-132 (Anamul Haque 42, Shakib Al Hasan 37*, Tamim Iqbal 30, Basant Regmi 1-14) beat Nepal 5-126 (Paras Khadka 41, Sharad Vesawkar 40, Al-Amin Hossain 2-17) by eight wickets. The Nepalese team scored 126 runs after losing five wickets in 20 overs and the Bengal Tigers hammered 132 with eight wickets in hand and 27 balls still available. Al-Amin Hossain (Bangladesh) was declared ‘Player of the match’ for his economic bowling spell of 2-17. The ICC World T20 – 6th match, First Round, Group A, was played on Tuesday, March 18, 2014, at Zahur Ahmed Chowdhury Stadium, Chittagong. Earlier, Mushfiqur Rahim, the captain of the home side, won the toss and invited the visitors to bat first. The decision paid off as Nepal lost three wickets at 39 in 6.3 overs when their skipper, Paras Khadka, and Sharad Vesawkar associated at the crease. The duo kept on crawling and went past the hundred runs mark in the 17th over with 3 fours from first. The fourth wicket accumulated 85 runs and took the score to 124 when Khadka was clean bowled by Mashrafe Mortaza for 41. Vesawkar followed him two runs later for 40 as their team managed 5-126 after 20 overs. Al-Amin Hossain was the top wicket taker with two whereas Mashrafe Mortaza and Farhad Reza got one wicket each. Tamim Iqbal along with Anamul Haque opened up briskly by smashing 53 in six overs with 3 sixes and 5 fours. The first was caught by Sagar Pun off Basant Regmi at 63 at his personal feat of 30 and was replaced by Sabbir Rahman. Anamul Haque was the most attacking of the two but was unluckily run out for 42 off 33 balls with 2 lofty sixes and 5 fours. 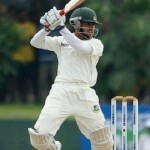 Shakib Al Hasan took guards next and made his intentions clear by hitting a six in the 12th over. He continued with his blast, dispatched 2 huge sixes in the 15th one and sent the third ball of the coming over flying over the fence. Shakib Al Hasan remained unbeaten for 37 off 18 mere deliveries comprising 4 giant sixes and 1 four. Shabbir Rahman secured his end for 21 as the hosts piled up 2-132 in 15.3 overs. Bangladesh won the encounter convincingly and is currently positioned on top of their table with four points.